In a quick interview at CNN’s New Year’s Eve Live with Anderson Cooper and Andy Cohen, Nicole Kidman has confirmed a tentative date for the upcoming season two premiere of HBO’s Emmy and Golden Globe-winning series, Big Little Lies. Reese Witherspoon and Kidman are returning as both stars and executive producers of the show. 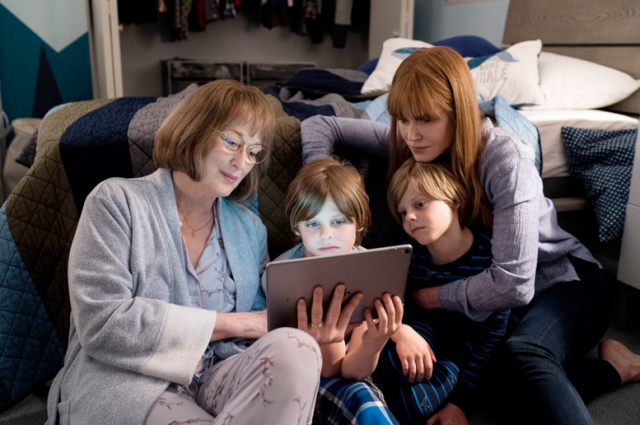 The leading ladies are being joined by three-time Oscar-winner and 21-time nominee Meryl Streep (The Iron Lady, The Post), who was announced last year as being cast in the role of Mary Louise Wright, the mother of Alexander Skarsgård’s Perry Wright. Mary arrives in Monterey concerned for the well-being of her grandchildren following the events of the first season. Shailene Woodley, Laura Dern, and Zoe Kravitz are also set to return to the series. In season 2, Woodley’s character Jane Chapman will be processing Perry’s sudden death in the storyline, while trying to build a new life for herself and her son, Ziggy. Dern’s Renata Klein, a woman who will be faced with new challenges in her marriage. Bonnie Carlson, Zoë Kravitz’s character, will confront her past while struggling to come to terms with Perry’s death. Writer and showrunner David E. Kelley will write all seven episodes (just like the first season) which are partially based on the book by Liane Moriarty. He will executive produce alongside Kidman and her Blossom Films topper Per Saari, with Witherspoon executive producing through Hello Sunshines Banner. Bruna Papandrea, Jean-Marc Vallée, Nathan Ross, and Gregg Fienberg will also executive produce. Director Jean-Marc Vallée (Dallas Buyers Club), who shot all the episodes in Season 1, will not direct this coming season. Andrea Arnold (Transparent, American Honey) will take the helm for Season 2, as well as serving as an executive producer. The first season of Big Little Lies took home eight Primetime Emmy’s, including statues for Nicole Kidman, Alexander Skarsgård, Laura Dern, Jean-Marc Vallée, and Outstanding Limited Series. The series also won four Golden Globes, including Best Television Limited Series.